Building cabinets can be one of the most satisfying aspects of woodworking. Sure, cabinets are little more than large plywood boxes for storing items, but they are found in nearly every house in the kitchen, bath, and other locations. Sprucing up your cabinets can be as simple as adding new cabinet doors, be they slab-style cabinet doors, cove raised-panel cabinet doors or one of many other styles. If you're building cabinets for your home, there are a few common cabinets around which you can design your storage layout, including base cabinets, wall cabinets, pantry units, blind-corner base cabinets, and more. One style that many people don't always consider is a built-in bookcase cabinet to match the other cabinets in the room. Sure, these are great if you have a dedicated library, study or other such room in the home, but when incorporated into a kitchen, dining room or bedroom, the bookcase cabinet can provide a great place for displaying not only books, but other treasured items such as trophies, knick-knacks, and framed photos. The bookcase cabinet described in the following paragraphs is designed as an 84-inch tall, 12-inch wide, 12-inch deep modular unit matching the standard height from the floor to the top of a set of kitchen cabinets, but you can modify the design to fit your needs appropriately. The shelves are mounted into dadoes in the cabinet sides with a rabbet around the back of the unit to accommodate a 1/4-inch plywood back. A pair of nailers installed in the unit allow for permanent mounting to the wall and screen mold can be used to cover the exposed edges of the plywood if you do not wish to install doors on this unit. Another modification you might consider would be to use shelf support pins in holes fore and aft on each side of the cabinet that allows you to raise or lower the height of all but the top, bottom, and center shelves. Note that the shelf sizes noted above are for permanently-mounted shelves. If you wish to use shelf pins and have adjustable shelves, you'll want to adjust the sizes of these moveable shelves to 10 and 3/8 inches by 11 and 1/4 inches. You'll also need to cut a sheet of 1/4-inch plywood cut to 83 and 1/4 inches by 11 and 1/4 inches for the plywood back. Once all of these pieces are cut, set up a stacked dado blade set at 3/4-inches wide in your table saw, and clamp a sacrificial strip of plywood or 1x4 onto the side of the fence facing the blade (this strip should be about the same length as the fence, and the clamps should be well above the table so that they don't interfere with cutting the rabbets). Adjust the fence so that the sacrificial strip is just against, but not touching the dado blade. Turn on the saw, place one of the bookcase sides with the inner face down on the table, and cut a 3/4-inch wide rabbet on the top and bottom edges of the bookcase side. Repeat with the other bookcase side before turning off the saw. Lower the blade and adjust the position of the fence so that the sacrificial board covers 1/2 of the width of the dado blade, so only 3/8-inch of the width of the dado blade is exposed. 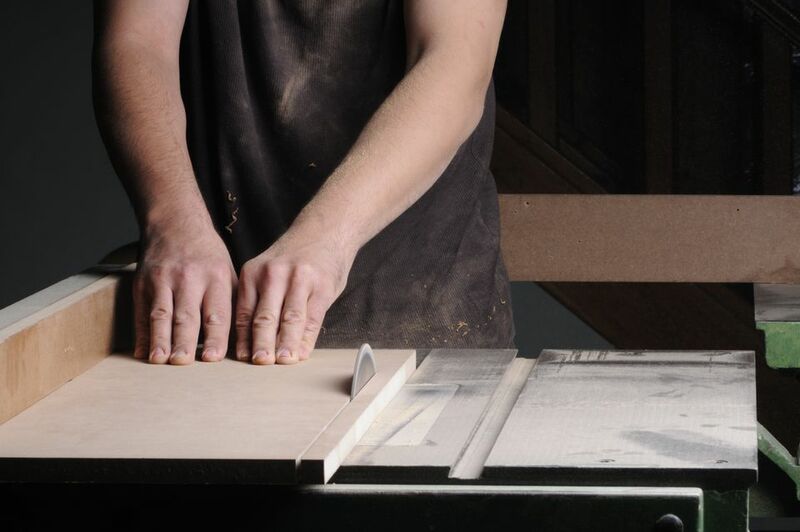 Turn on the saw and raise the dado blade so that the height of the blade is 3/8-inch above the table top, which will cut slightly into the sacrificial strip. Position one of the bookcase sides with the inner face down on the table, and cut a rabbet along the back edge of the bookcase side. Repeat with the other bookcase side. Remove the sacrificial strip and clamps from the fence. Adjust the fence so that it is 47 and 1/4 inches from the closest edge of the dado blade. Place one of the bookcase sides face down with the bottom edge against the fence, and rip a dado into the bookcase side to accommodate the center shelf. Repeat with the other bookcase side. If you wish to have other permanently-mounted shelves, adjust the fence and cut dadoes for these shelves. Otherwise, use a power drill with a 1/4-inch bit and a shelf hole drilling template (or a plunge router with a collar if required by the template) to drill your matching holes in the bookcase sides. Place one of the bookcase sides on a work table with the dadoes facing upwards. Place a small amount of wood glue into each of the dadoes and the top and bottom rabbets. Spread the glue to an even layer throughout all of the faces of the grooves, and then insert a shelf into each of the grooves so that the front edge of each shelf is even with the front of the bookcase. Using a pneumatic finish nailer, toenail a 1-1/4 inch finish nail through the top edge of the shelf and into the bookcase side using an angle that will embed the nail through the shelf and into the bookcase side plywood without blowing the end of the nail through the back side. One nail fore, center, and aft will secure the shelf. Repeat with each successive permanent shelf until all are securely fastened to the bookcase side. Position the mating bookcase side next to the assembly and apply glue to each of the dadoes and rabbets in this matching side. Flip the assembly over and insert the shelves into the dadoes and rabbets, and secure with the finish nailer. Rotate the entire assembly so that the front edge of the bookcase is face-down on the table. Insert one of the nailer strips directly beneath the top shelf, perpendicular to the shelf (so that the 3-inch width is aligned with the edge of the rabbets in the bookcase sides. Attach this nailer to the top shelf and the sides using 2-inch finish nails. Repeat with the second nailer just below the center shelf. Cross-measure the assembly to check it for square, then place the 1/4-inch plywood backer into the rabbets around the edge of the assembly. Tack the backer to the assembly on all four edges using 1 and 1/4 inch finish nails every six inches around the cabinet. The assembly of the cabinet is completed. To install, simply place the cabinet into the desired position against the wall, and drive 3-inch wood screws through the nailers into wall studs behind the drywall or plaster of the wall. Pre-drilling and countersinking the holes in the nailers will give a better-finished look after applying any paint or stain to the bookcase.